The world’s first copy of Windows 8 being sold in Auckland, New Zealand. The software was sold to Greg Daniel at one second past midnight New Zealand time at Harvey Norman Wairau Park on Auckland's North Shore. 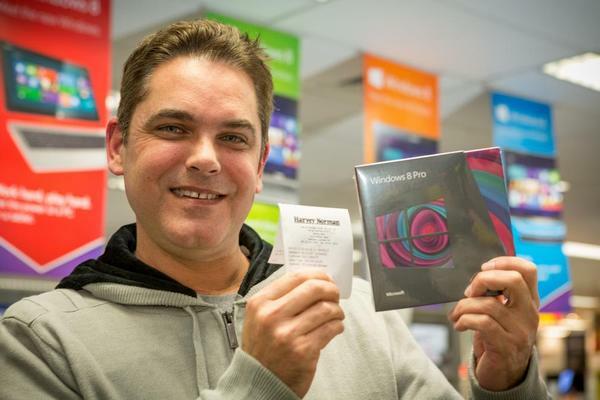 Greg pre-ordered his copy of Windows 8 Pro from Harvey Norman Wairau Park as soon as the exclusive pre-order offer opened on 23 October. "This is the most innovative release from Microsoft since XP. I'm really looking forward to getting constant updates from my Facebook and other social networks with the live tiles, as well as from some of my favourite apps like weather," says Greg. "I'm excited about getting it loaded onto my laptop and taking it for a test drive."